Matsushita&yuikonnu - LOVE x LOVE Whistle [Taiko] · forums · community | osu! ⏩Find a more HD pic for the BG? Songs with variable BPM may use frequent slider velocity changes in order to keep the scrolling speed at which notes move approximately constant. Doing this will make the timeline gaps between notes easily predictable and enhance gameplay experience by avoiding overlaps due to BPM changes. ⏩I can see applied style in this diff so I can’t complain for anything in terms of dons and kats. Patterns on snaps faster than 1/3 are disallowed. These patterns are too complex for beginner players. ⏩00:08:690 (53,54) - these are off the same pitch, consider rethink the pattern here. ⏩00:13:940 (23) - Without this finisher but the previous ones do seems weird to me. You may want to finisher this as well. ⏩00:20:690 (10) - This filler seems unnecessary, should probably leave this blank. ⏩00:41:127 (74) - Maybe change this to k? For the pitch rise. ⏩00:54:815 (156,157) - Change to k k? d d d seems dull and these can definitely be nicer if they are k k I think. ⏩01:07:785 (229,230,231,232,233,234,235,236) - ddkdkkdk? I think it should work better in terms of representing the music. ⏩01:09:118 (237,238,239,240,241,242,243,244) - Same thing applies, but you can make it more fun by adding variations like kddk to replace kkkk for example. ⏩Before 01:39:284 (409) - I think these patterns are too repeatitive, that may bore the players. ⏩01:44:951 (440,441) - I think you can change this to d K to emphasize the K better. ⏩02:15:034 (90) - Cancel this finisher? You don’t have it at 02:19:034 (109) - . ⏩03:07:745 (245) - Why two finishers here? You don’t have it at 03:05:079 (232) - . ⏩01:13:118 (55,56,57,58) - Ctrl+g? K sounds better on these natural-pitched sounds I think. ⏩02:37:912 (560) - Make this having a SV change like in 01:20:784 (96) - 02:48:579 (631) - , and finisher them? ⏩02:58:079 (686,687) - Ctrl+g? The pitch descends here. 15:17 Faputa: I want to mod another map of yours can I? 15:19 Faputa: and you have this mapset so I can go for more equal modding right? 15:25 Faputa: or this 02:48:579 (218) - Was it like a design or somewhat? 15:35 Faputa: 01:49:951 (309,310) - how about a K K instead of D D? 15:38 Faputa: 02:00:534 (361,362,363,364,365,366,367) - feels a little bit weird? 15:42 Faputa: should you use kkd or kdk instead? 19:44 xfraczynho: me harías una testplay? From my queue, a bit late sorry. 01:58:784 (6) - It's such a drastic change in bpm and theres nothing to really grap onto for rythm which makes this a very tough transition for Kantan. I think you should delete this note at least from the first 3 sets here. At 02:06:784 (18) - it seems better now that the player is more familiar with this new bpm. Similar to Kantan the bpm chanches in the map and the inability to quicky catch onto the new rythm is very hard. I think you should seriously consider making the beginning of these sections less intense to give the player time get into the new bpm. 01:06:285 (5,9) - These could go to ease this. 01:57:784 (7,9,14) - These as well. 01:07:951 (11,12) - This is very hard for Futsuu. We've just switched to a new bpm and getting used to it so picking up a pattern with no downbeat seems tough. 01:31:284 (86,104) - Very intense section for Futsuu, you could consider deleting a few of these upbeat notes for a bit of a breather. 02:13:034 - Seems too intense for Futsuu at 240bpm, we should find something to delete. For example 02:13:784 (61,65) could go. 02:23:412 (93) This note seems unnecessary and again would help with the tempo change transition. 02:25:746 (101) - Again kind of rough, I would rather just have this as d at 02:25:579. General : Note placement is good, map is just too intense with too few breaks. I will just give a few examples, feel free to choose how you do it though. I just feel you have to add some breaks in almost every section. 00:24:440 - Note density too high here onwards, you should consider deleting a few to fit in atleast some 1/1 breaks. For example these 00:25:752 (35,45) etc, or 00:25:377 (32,33,42,43) - etc. 00:37:940 - Same as ^ Would find something to axe for 1/1 breaks. For example 00:39:252 (63,72) - etc. 01:57:659 (4,9) - Same as in Kantan and Futsuu, deleting these helps a lot with the transition to the new tempo. 01:29:618 (352) - It's so different from the rest of the song we could just delete these triplets to make this section a bit more unique. 01:34:368 (380) 01:39:701 (411) - Would delete to allow Finisher in the next note. 01:57:721 (8) - Again with the bpm adjustment for the player. Deleting just this one notes makes this transition much better. 01:58:159 - Exhausting. I wouldnt mind a few extra breaks for the longer patterns. 02:16:784 (157) - d ? 01:31:284 (86,104) - Very intense section for Futsuu, you could consider deleting a few of these upbeat notes for a bit of a breather. That section is not very long and also quite repetitive plus it has 3/2 breaks. Even though it increases SR by some fairly high amount I think it's easy enough for a futsuu. 00:15:065 (38) - Switch to k? 00:35:877 (94) - Change to d? The pitch is different than 00:35:315 (92). 00:43:940 (120) - Finisher, like you did at 00:37:940 (101)? 01:08:618 (14) - d, to emphasize the higher vocals at 01:08:785? 01:29:118 (78) - Finisher? You mapped the cymbal at 01:34:451 with a finisher. 00:06:346 (30) - Delete? I don't think a triple is necessary here. 00:24:440 - This section feels strange to me. The song is using doubles, so I don't think you should use triples here. 01:03:785 - Sorry if I'm mentioning this too much. You should add breaks here in some way. I know this is a guest diff, but even the Oni uses 1/1 breaks here. 02:03:034 (31) - Remove finisher, since you didn't use one at 02:11:034? 02:56:912 (190) - Remove finisher? You didn't use one at 02:54:245. 00:01:065 (8) - Deleting notes like this, so the note density isn't as extreme. But if you think it's fine, it's probably not an issue. 00:07:377 - The length of 1/6 here seems a bit extreme. It's playable, of course, but consider doing something similar to 00:13:377. 00:36:158 (277,278) - Switch these, since you used d at 00:30:252? 01:24:617 (154) - Use k like you did at 01:25:950? The pitch sounds the same to me. 00:25:752 (35,45) etc, or 00:25:377 (32,33,42,43) - etc. 00:13:565:, 00:10:565 - why isn't this kdddddkdddddkdddddk ? At least to 00:15:065: , I think that this map is taking the drums actively. So, if you don't take the drums from here onwards, it'll not be consistent. At least, take striking kat surely. from 00:37:940 - as well as above. from 01:39:784 - take k.
from 01:57:034 - as well. 02:16:534 (202,203,204,205,206,207,208,209,210,211,212) - kdkdkdk.k.d.d.k (1/6+1/4) ? 02:20:534 (239,240,241,242,243,244,245,246,247) - I think this is 1/3. from 02:32:912 - take k.
03:10:023 (362,363) - kk(1/3) : I think only d rhythm is not very interesting. It triggers boredom of players. Below Oni, I omit because it's just a similar point. 00:49:940 (297) - Add finish? Look it stead melody with vocal. 01:02:315 (382) - Add finish? The melody is long haul look good to add finish. 01:39:784 (198) - Add finish? Look it stead melody. 01:45:118 (235) - Add finish? Look it stead melody . 00:05:690 (26,28) - Ctrl+g? Look it follow a melody better. 00:08:502 (40,41) - Same as above ^. 00:11:877 (11) - Change to k? for some different part. 00:14:877 (26,27) - Change to k D? for follow a part before will use D all over. 00:37:940 to 00:49:565 - Same as above ^. 00:49:940 (124) - Add finish? Look it stead melody with vocal. 01:03:785 (199,200,201,202,203,204,205,206) - Remove this and change to spinner. 01:15:784 to 01:20:451 - Same as above ^. 01:21:118 to 01:26:451 - Same as above ^. 02:32:912 to 02:37:579 - Same as above ^. 02:38:245 to 02:41:912 - Same as above ^. 02:43:579 to 02:48:245 - Same as above ^. 02:48:912 to 02:52:579 - Same as above ^. 00:46:190 (126,127) - Ctrl+g? Look it look better and different with 00:40:190 (107,108,109) - . 00:58:565 (164,165) - Same as above ^. 01:02:315 - I think you can add note here for consistency with another diff. 02:15:784 (69,70) - Ctrl+g? Look it look better. Last edited by [deleted user] , edited 4 times in total. 01:57:034 - i think is not well of this sv? 01:55:784 - try this? 00:00:440 - about this part... how do u think of this pattern? 02:43:579 - i think here need some different pattern? any 1 3 5? 03:04:412 - add a note here? k d ? -) Preferably if you haven't looked around yet, a new background with a better quality could be used. Might look on my own for one. -) 00:50:315 - since the 2/1 barline looks silly imo you could activate the Omit Bar line function to remove it. -) 02:21:184 - 02:21:337 - 02:21:513 - 02:21:670 - 02:21:823 - 02:21:985 - Consider activating the function for these lines too, although they aren't significant for the gameplay. 01:20:784 - I think you could still push it to 1.35x to improve the effect of the Sv increase. 01:47:118 (250) - Consider removal of the note to have a consistent break of the pattern chain like 01:44:451 - and 01:41:951 - . Guess something went wrong with the OD. Reduce it to 5~4.5, HP optionally to 5.5. I strongly suggest to remove the SV increases, used from the higher difficulties. They won't work very well for the respective difficulty level class. Do only use them to adjust the BPM changes. 00:37:940 - 00:49:565 - The section lacks of actual emphasis. imo it doesn't really represent the section of the song so well and feels too random. The part between 00:37:940 - 00:40:940 - could be reworked like this: https://derpovic.s-ul.eu/pXQXmiYe.png (that provides more breaks that gives room for more dedicated emphasis and simplifies the pattern chain that works well corresponding to Oni and Futsuu), or for 00:40:940 - 00:43:940 - : https://derpovic.s-ul.eu/jV1aLrRj.png (just some more breaks and color changes to emphasize stronger sounds such as vocals). Generally it is never bad to use (smaller) breaks, formed as 1/1, 2/1, 4/1 to create emphasis. 00:50:315 - 01:02:315 - same applies here, you may want to be consistent with the ideas. 01:05:285 (212) - coulda be removed so the combo chain isn't so long at all. 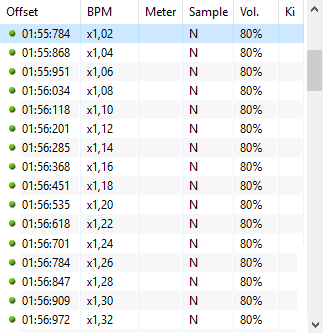 01:07:951 (230) - 01:08:951 (236) - 01:10:285 (244) - ^, consider the BPM changed drastically so having the same density and combo lenght isn't always good. 01:28:784 - 01:39:784 - this section may also be simplified since Oni and Inner Oni are kept pretty simple as well, comparing to Futsuu it also seems like a too big jump and less linear. Removing the triplets for the most part (or completely) should do a big part to make the difficulty curve more consistent. 02:08:534 (59) - instead of k k k you could use k d k to emphasize the drum hits more. Generally the difficulty has some trouble to emphasize sufficient sounds and beats and feels dull to play. However, there is still enough room and time for improvement, don't take this too personal what I write. 00:09:065 - imo I find the break more appropriate at 00:09:815 - . Note at 00:09:815 - can be moved to 00:09:065 - instead. 00:37:940 - 00:40:940 - Might rework that part a bit since every 2nd 2/1 break is sorta weird and not necessary to have at all. https://derpovic.s-ul.eu/mgNKyTTx.png Try to repeat that. 01:05:118 - 01:10:118 - Personally I don't really like that part. Some oppoturnities getting lost and the rhythm is pretty odd to follow. https://derpovic.s-ul.eu/SXZkDcf3.png Highlighted notes are finishers. 00:06:065 - What about a note here? as well for 00:09:065 - and 00:12:065 - . Probably too dull to only include 1/1 notes here. 00:27:065 - ^ as well for 00:30:065 - 00:33:065 - 00:36:065 - . WTF TRIPLE posTTTT it's so bugged! yeah it looks nice, done! oh i fixed on maziari's mod, thanks for pointing so! i want to overmap as long as i can here, since it's the last 'hard' part of the map! I will find some tomorrow! Thank you for the comments Stef! Fixed all unless stated otherwise. Thanks for modding!